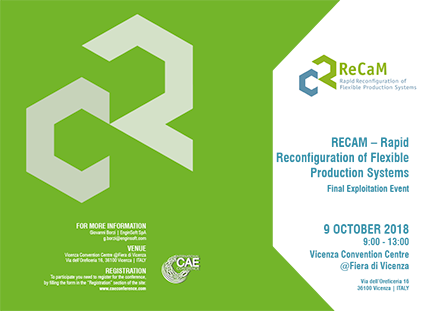 Maria Del Mar Otero Garcia, Compañía Española de Sistemas Aeronáuticos S.A.
After the Exploitation Event it will be possible to further discuss the project results the RECAM stand located in the Research Agorà area. The main goal of RECAM is to develop and demonstrate the next generation of flexible production systems leaning on the reconfigurable modular production resources, associated engineering tools and control systems. The RECAM tools aim to support the capability based reconfiguration and auto-programming of the resources to a set of given product requirements. The project developments support the design and operation of future production systems that allow quick, cost efficient set-up and the fast integration of new product variants. strong support for standardisation of communication protocols, data structures and tool connectivity. The exploitation event has the aim to showcase the RECAM approach and results to interested Stakeholders from industry and academia.